A few weeks ago, I posted a schnitzel recipe from Cliff’s UK Cookery School book. 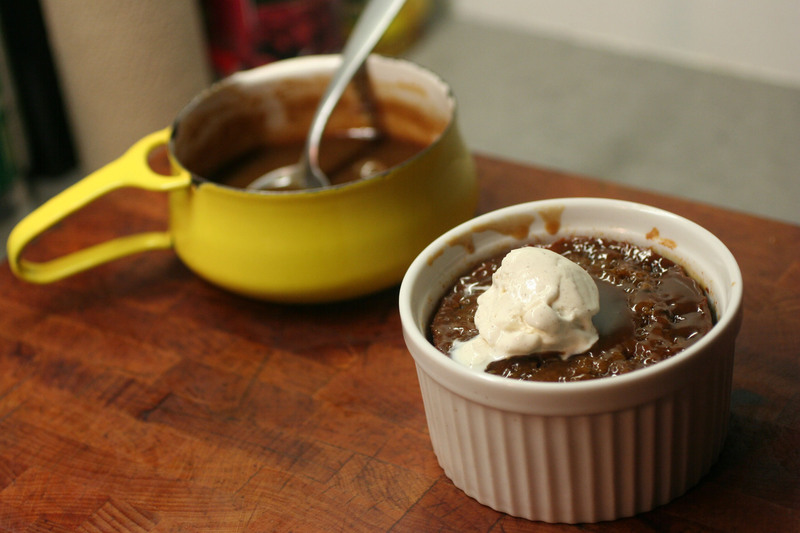 As promised, here is a second recipe from there– Sticky Toffee Pudding. Love this super sweet dessert- and figured since it is an english dessert- might as well use an english recipe. 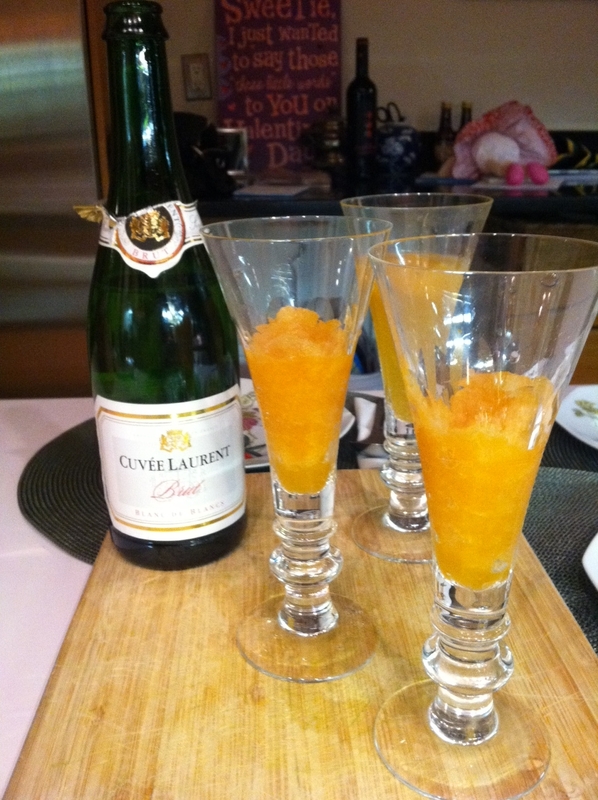 though i did take some pointers from a similar recipe- posted on David Lebovitz site. this is definitely a dinner party/special occasion type dessert. but the toffee can, and should, be made anytime. great over ice cream. or i don’t see why it wouldn’t work in the banoffee pie? or at least a banoffee pie like sundae. yum. Anyway. the most annoying part of this recipe was translating all the UK amounts/ingredients to US but- i did that for you– so jolly good then, carry on. I put mine in 6 individual ramekins, though if you don’t have i’d recommend muffin tins. the 6 are a little big serving so I think 12 muffin-sized would be great. could use paper liners and all. David Lebovitz also makes one in a big round dish- which I think would be good, but i’d imagine wouldn’t have the same good crunchy outside to inside gooey balance- as he also tries it w. one of those maze-like brownie pans too so every piece has an edge. *Sugar note. Muscovado is basically an unrefined sugar. The books say– “It is a more natural type of sugar and there is more molasses at the center of the grain which gives the dish a more caramel taste.” While I didn’t buy sugar branded as “muscovado” (sold for like, $7 at union market) I bought the organic unrefined sugar— which I think is pretty much the same. Quite a bit coarser than refined sugar. ** this stuff called Lyle’s Golden syrup is friggin delicious. I snuck it back from London last time I was there– but you can get it in some Brit stores in nyc (there are several). 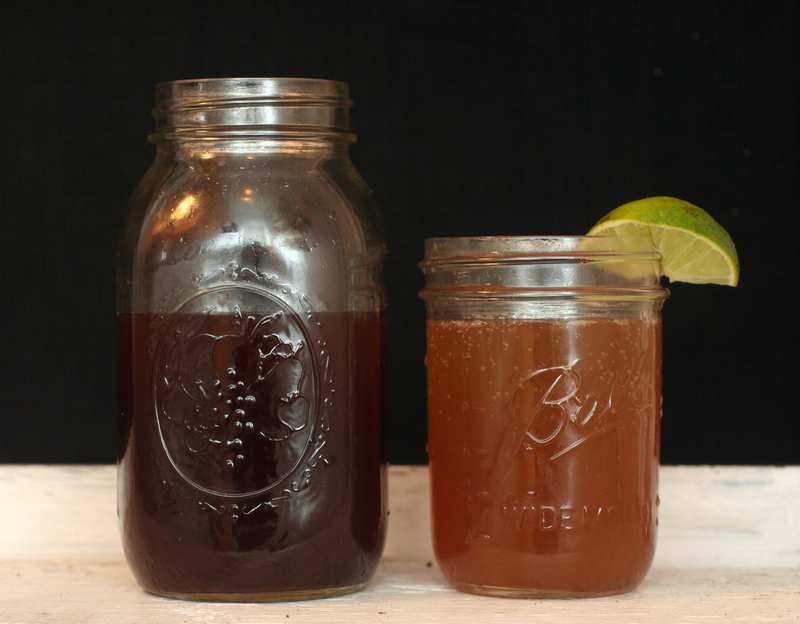 It tastes like a magical blend between honey, maple syrup and molasses. 1. Put chopped dates in a medium size bowl. Pour over 1 cup of boiling water and baking soda and set aside to soak for 10 minutes. 2. Meanwhile, in a large bowl cream butter and light muscavado sugar together until pale and then gradually beat in the eggs and golden syrup. Fold in the flour (w. your additions to make it self-rising) and ground ginger, and then stir in the soaked date mixture. 3. Grease ramekins w. butter. Pour this sponge mixture into 6 small ramekins. 4. Place the filled ramekins onto a baking tray and put in the preheated over for 20-25 minutes, until the top of the pudding is just firm to the touch. 5. To make the toffee sauce, put the butter in a medium-sized frying pan over a medium heat. Once the butter has melted, add the dark muscovado and stir to dissolve. Finish the sauce by pouring in the cream and cook for a further 2 minutes then remove from heat. 6. To serve. They say you can run a knife gently around and invert onto a plate. Pour sauce over and serve w. a scoop of vanilla ice cream. This did not work for me– plus I like the look of serving w. in the ramekins, so I just did that. 7. If making ahead— reheat your cakes in a 300 oven— and would recommend, as David does, use a chopstick to make a couple holes in each cake and spread me toffee over. Cover w. foil and bake. He says use half toffee for your big cake– and reheat at 300 for 30 mins. For individual I just spread a spoon of toffee on each. Covered w. foil. Heat for 30 or less. 8. Heated the extra toffee up and served on the side. i have two choices for you. both from marcella hazan (as most of my italian recipes are.) one is a low and slow bolgnese. the other is the most super simple tomato sauce. the bolgnese, marcella says can cook from 3 1/2 to 5 hours. i ate my first meal of it at 3 1/2 and tried it again at 5 and was amazed at the difference– creamy, tasty and worth the time, no doubt. but if you are going to spend 5 hours making the sauce, then i think we should at least double it– amounts i have put in [ ]. though meat sauce freezes well, i think, so you could always triple or quadruple original if you felt so inclined. also- i think if you are going to put this much effort in- go out and buy some fresh pasta (or make it.) I got a tagliatelle, which i love– but of course it will work with anything. Enjoyed some of the leftovers w. polenta and fresh mozzarella… and then– because that’s what i eat w. all my lunches- i mixed some up w. wheatberries. -it must be cooked in milk before the tomatoes are added. this keeps the meat creamier and sweeter tasting. 1. 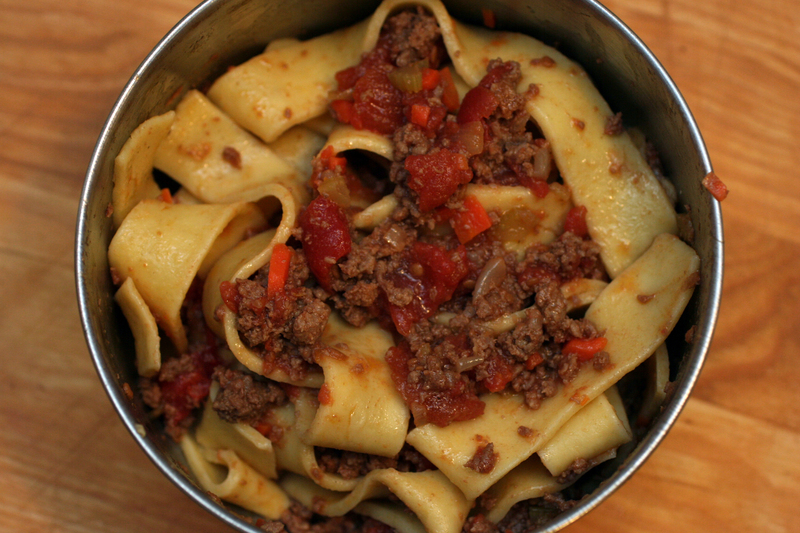 Use an earthenware or heavy cast-iron casserole, the deepest you have (to keep the ragu from reducing too quickly.) Put in chopped onion with all the oil and butter and saute briefly over med heat until just translucent. Add celery and carrot and cook gently for 2 minutes. 3. turn heat back down to med, add milk and nutmeg and cook until evaporated [same note as above.] stir frequently. What’s so amazing about this sauce is that there is barely anything in it. just tomatoes, butter and an onion– which you take out after its cooked. Seriously, there is no reason to buy canned sauce again. For New Years Eve, we used in Pasta Bake. If using canned tomatoes, start at step 2. 1. wash the tomatoes in cold water. cut them in half lengthwise. Cook in a covered stockpot or saucepan until they have simmered for 10 minutes. 2. Puree through a food mill [or immersion blender] and put back in pot– [i didn’t do this– just used hands to crush the tomatoes.] add the butter, onion, 1 1/2 tsp salt, and sugar and cook at a slow but steady summer, uncovered for 45 minutes. Taste and correct for salt. discard the onion.